I commented on the same trend on AustinMarketDashboard.com. The difference in my site and the data used by the American-Statesman is my inclusion of all residential properties rather than only single family homes. 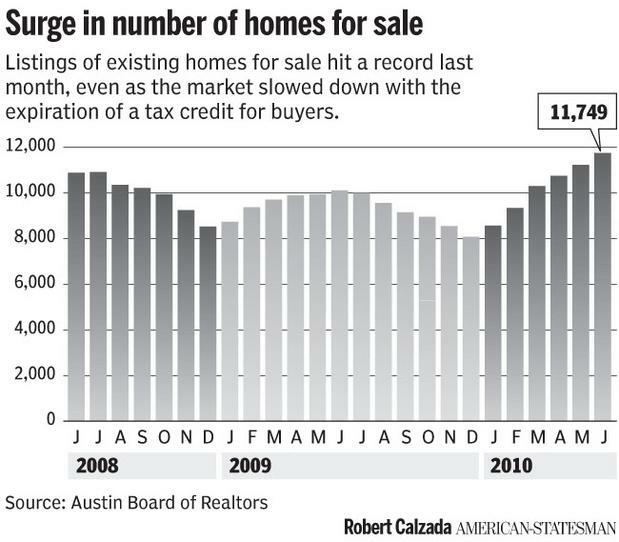 There is no doubt that sellers’ expectations for the summer selling season coupled with two rounds of homebuyer tax incentives which accelerated demand has left the Austin/Central Texas market with inflated listing inventory. It is also true that June sales were down 3.7% from May and 1.8% compared to April. On the other hand, June home sales were 10.8% higher than in March. This is clearly the effect of the homebuyer tax credit program that required closing by June 30. We have been here before. June 2010 inventory is very much like June-July 2003, just before the housing boom that peaked in 2006-2007. Today’s inventory is only slightly higher than in May-June 1997, at the beginning of the dot-com boom, the market cycle that peaked in 2000 when that tech boom went bust. For further comparison, look at the inventory level in mid-1990 — 10 months’ supply in May 1990, with enough inventory to last more than 9 months for virtually all of that year. That was the result of the savings and loan crisis, a flood of home foreclosures, the formation of the Resolution Trust Corp, and a crisis in home values much like we have seen in this cycle. Every market cycle is different, and today’s downturn and recovery depend much more on international economies and investor confidence than the 1989-1990 period. Even in Austin — as strong as our market has remained — we are not through this storm yet, but we have been in similar circumstances before, and we probably will be again. In the meantime, I remain confident that we will see a meaningful recovery and good market appreciation in coming months and years.